Bjartmars Favorittkro, The restaurant just off the Atlantic Road! Bjartmars Favorittkro is located on Averøy, just off Atlanterhavsveien, between Kristiansund and Molde. There are great views of the sea and islets from our cozy restaurant. You can also enjoy first-rate good food and drink here on our terrace with outdoor seating facing the sun and sea! We want to serve good and delicious high quality food at reasonable prices. You can enjoy your meal in the warm and cozy atmosphere between our 170 year-old timber walls! Bjartmars Favorittkro can receive groups. Please contact us by telephone at +47 91618346 for booking or information. Our menu is customized according to season. 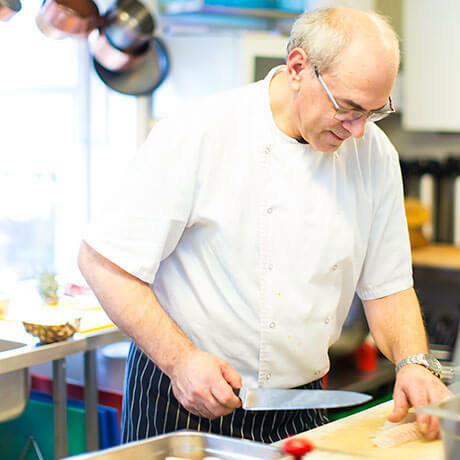 We are proud to prepare good quality food with fresh produce from our local suppliers. 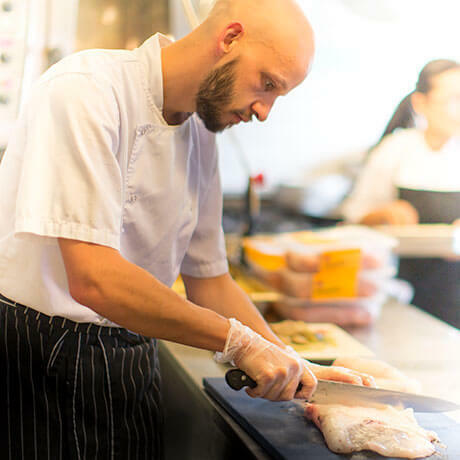 Our halibut is produced locally at Nordic Seafarms at Henda and we serve award-winning dried and salted cod from Sigurd Folland on Kjønnøya. The crayfish come from the Romsdalsfjord. It's the taste that matters! We bake fresh bread every day using special types of flour from Volda Elektriske Mylne in Volda at Sunnmøre. On our beverage menu we have raspberry juice from Halaas Gårdsutsalg in Eide and apple juice from Fonte Verdi in Molde. Have you tasted the best cheese in the world? We offer tasty and award-winning cheeses from Tingvollost at Tingvoll and Derinngarden at Eide. In particular, we would like to recommend that you taste the cheese that was voted the world's best cheese in competition with 3,021 cheeses from 31 countries, at the 29th World Cheese Awards in 2016. Kraftkar cheese from Tingvollost! This dish is a tradition in our district, Nordmøre, and the main ingredient is salted and dried cod. Salted dried cod has been exported from here since 1690. Trade with Spain, Portugal, Italy and South America not only resulted in income and prosperity, but also import of tasty ingredients from these different cultures. The recipe for Bacalhau must have come here in the 1830s. Tomatoes and paprika were exotic ingredients at the time. Since the outset, enormous amounts of fish have been dried on the rounded rocks that you can see examples of along Atlanterhavsveien. It is from these naked rocks, the 'cliffs', that the fish gets its name in Norwegian. 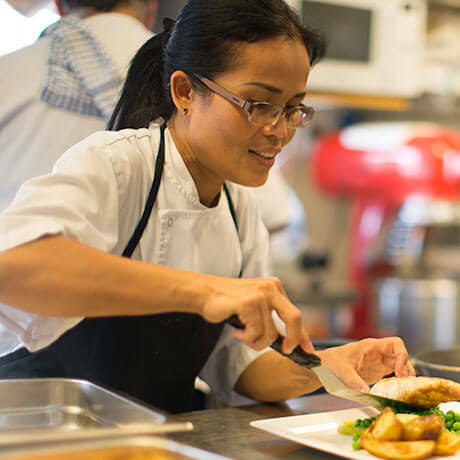 Our chefs have international experience, in addition to also being able to prepare traditional Norwegian dishes. Bjartmars Favorittkro won 1stprize for the best Bacalhau in 2012 and 2014! Every Sunday we welcome you to our popular Sunday Buffet, featuring roasted meat, tasty fish, salads and delicious desserts. We have a separate buffet for kids, with food that the kids like! Children up to the age of 3 eat for free at our Sunday and Easter buffets and our Family Christmas buffet. Every Thursday we serve Dumplings, a traditional favorite meal for many Norwegians. Our potato dumplings are prepared according to grandmother's own recipe, along with good traditional sausage, salted meat, crispy bacon and vegetables. The atmosphere in the restaurant is extraordinary on Thursdays, where acquaintances meet each other. Here you can sit together for a better meal and a good chat. We also offer potato dumplings as a take away if you wish.